updates from time to time. Harold Dickert has been a compulsive builder of “Stuff” since he could remember. He learned exacting woodworking skills early on in his teens as a designer and builder of Balsa Wood model aircraft. High School employment making working Spinning Wheels (for spinning wool) honed his skills with wood shop equipment. Carpentry work amongst other job while employed at a Landscaping firm not only expanded his love of wood working, but also his knowledge of local trees (from which many of these tone woods come). His love of the guitar started in 1968, the year he received his brand new Japanese Toledo brand electric guitar. It didn’t take long for modifications to begin. He built a 7-string electric way back in 1977 (using the equipment at the Spinning Wheel Factory) and started a Double neck. He has continued to play both electric and acoustic steel string guitars all these years. His advancing career as a Professional Pilot put “Building Things” on hold until the fall of 2001, at which time he rented shop space to devote his spare time to building guitars. In the late 90’s, he was a member of the City of Burlington’s Sustainable Development Committee were his personal focus was on restoration of natural habitats, including replanting of local Carolinian tree species. This again expanded his appreciation of diverse varieties of trees, leading towards his interest in exploring the use of exotic (in the guitar world) species of trees. He is now building custom Steel String Flat Top Acoustic Guitars as well as Solid Body (and Chambered) Electric Guitars. His knowledge and love of trees and their woods has continually increased, reflected in the diversity of materials employed in the construction of his instruments. His propagation of uncommon and rare native trees for use in environmental restoration projects has also lead to the discovery of new tone woods. The use of French Polished Shellac finishes for his acoustic guitars provides for a sonically superior instrument, is easily renewable, and is also environmentally friendly. Questions from a Guelph University Forestry Student regarding the use of trees in the guitar industry. 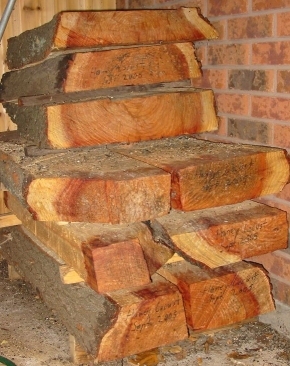 Looking for large size logs. The point of a custom hand made guitar is about getting exactly what you want. The tone, the feel, the look. It's about shaping the neck exactly for your hand. About choosing woods that are candy for your eyes. About including the components that you have always wanted. About having an instrument that is the perfect backup to your voice, or instead about having an instrument that no one can hear their voice over. The point is it's all about you. The first step in the development of your custom guitar is actually choosing the Luthier. I hope that's me, but it could be someone else. It depends on the type of guitar you want. Not all luthiers will build all types of guitars, and even the best luthiers out there may not build your ultimate guitar. Guitars just like great music, may involve more than a little collaboration, and ideas that need to lines up. 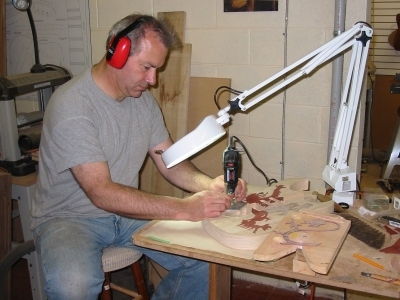 Usually the types of guitars built depend on the luthier's musical background. In my case, I've played electric solid body guitar all my life, and acoustic steel string flat top since I was an adult. I have ideas of what I want to see in a guitar, and if your thoughts and mine mesh, then we could have a great instrument come out of it. If you want a classical nylon string guitar, I can recommend some other builders. As a tree hugger and nascent horticulturalist, I can open up a whole world of exotic tone woods for you. If this is about getting your own sound, then why use the same old materials? In the case of acoustic steel string guitars, you could choose from one of my available molds, or you and I may just come up with a new shape. You could go with a standard 6 - string, or push the envelope with a custom 7 - string. Then there are my 4 - string Soprano Guitars. Other options include florentine or venetian cutaways, a sound port, an arm-rest, and fan-fret board. All my acoustic guitars are finished with a hand rubbed Shellac French Polish. So sharpen your pencil and get ready for a fun ride. Every once in a while I receive various e-mails from people asking questions about guitars, or building guitars, or guitar finish, or guitar set-up, or even about various woods. Then (winter of 2013) I got this e-mail list of questions from a Student in Guelph Ontario who on first read through, sounded like she was pawning off her homework project to me. Twenty five serious questions!!! I don't have time for this! These questions could and do fill entire books!!?? In fact a lot of those questions were with in the list of various questions I've answered over the years - one at a time - mind you. So one night after some French Polishing, I topped up my glass of Bourbon, sat down at the confuser and started typing. After a few nights of more typing and editing, I sent this document off to her. I've reproduced it here since the information contained here is relevant to anyone considering a custom guitar. This first question is a book in it’s self (actual many books), and an entire field of study. Think of any wood cutting tool and splitting tools, and some luthier somewhere will be using it. The direction cut across or with the grain is incredibly important as this is a mechanical structural consideration, a tone consideration, and it also affects the aesthetics. I have actually started a few projects with my chainsaw, then let the wood age, and afterward further cut it down to final sizes. I use a large bandsaw to rip acoustic guitar back and side sets, then a thickness planer and thickness drum sander to bring these parts down to their final thickness of .120” for the back and .085” for the sides. All this would have been done with hand planers and scraping blades in the past. Some areas of the instrument must be made of wood that is mechanically sound while other areas are almost purely about the look. A rosette, end-graft, head-cap, or heal cap, can be made out of wood that lacks any real strength, so even badly burled or spalted wood could be used for those parts. You could consider using burls and spalt because those qualities often made for amazing looks parts. On the other hand, a neck has to be perfect with no runout, knots, checks, bends, or worm-whole, and even the color should be considered on a clear finished neck. Here again, grain orientation can be used to bring out qualities such as, Flame, Birds-eye, Ppommele, Quilting, Silk, Quilting, Lace, while turning the lumber even a few degrees can obscure those. In some cases you would want to use the transition area between the heartwood and the sapwood to provide a color contrast. From a mechanical standpoint, you want “quartered lumber” since this orientation of grain structure gives the most stability with less shrinkage or warping. An acoustic guitar top has it’s own unique way of being prepared that starts with billeting and splitting in order to guaranty no runout at all and to ensure quartered lumber, also known as vertical grain. 2. You mentioned that you are growing your own trees - how long do you wait to use the trees/what age of tree provides the best quality wood? I am growing trees for environmental restoration projects. I will not live to see any of these trees become part of a guitar - well maybe a bit in a rosette or some other small part, but not a guitar top, or back, or electric guitar body. Just consider the size requirement for an acoustic guitar top or back. A back is a mirrored plate anywhere from 14” to 16” wide. So you need a 7” to 8” inch board to slice in half to get the two mirrored sections. Considering you never have perfect edges, and you will need to resurface these, you actually want an extra half inch over the initial quoted dimension. These parts should be made from quartered lumber, which means it comes from a wafer of wood along a line starting at the very center of the tree running out to the bark. So an 8.5” board takes a 17” trunk section so far, but actually there’s more. The center of the tree – the pith – is generally full of knots and bad wood, so add a few more inches, so now we’re up to somewhere between 20” to 22”, and then there is the area under the bark, often also not so great, and then the actual thickness of the bark. So a two foot thick section of trunk is actually a minimum size to use for an acoustic guitar. How ever you would not get very many sections out of such a small trunk since you could not cut successive quartered backs before running out of width of material. You would actually want a much larger tree. In regards to the age of the tree, most often you want very slow growing old growth trees. This is something the world is running out of, and plantation grown trees will not give the quality of instruments we are used to. In the case of guitar tops, these are almost always made of slow growing spruce. The reason for spruce is that it not only has one of the very best strength to weight ratios, it also is the third fastest medium for the propagation of sound (only steel and glass are faster) making is the best tone wood for guitar tops, followed by cedar. The trees that provide the best tone are the ones with the closest grain, with counts upwards of 25 to 35 lines per inch. This means that just the wood that is visible within the area of the guitar top represents almost 300 years of that trees life! To find trees growing that slowly, you have to go way up the slope of the mountain, and to the northern most sections of that tree species range, to find an incredibly hardy, old individual, that managed to survive and become large enough. Plantation trees just will not cut it. I get my guitar tops (Sitka spruce) from Alaska. Having said this, you will find lots of guitars with tops that have much lower grain counts, but if you look at the price tag, those are the cheapie instruments. 3. Do you manipulate the nutrients available to the trees to taylor specific results? I do not, since I am not growing trees for guitars. If there was someone growing trees to be used in guitars that actually had such a very long term objectives (which I’ll bet there is not), then they actually could do what you suggest. Koa is one of the premium guitar tone woods used for backs and sides in acoustic guitars and as drop-tops on electric guitars. It only comes from Hawaii. The big draw about Koa is the amazing flame pattern and color banding seen in premium samples of this lumber. These trees are now threatened but at one time grew all over the islands. It is well known that the very best examples of these trees showing the most flame and color come from specific altitudes up the volcanoes, where certain amounts of nutrients and rainfall exist. I’ve also just given the example of the Sitka. So the quality of the wood IS effected by nutrients, and someone adjusting these also would have an effect. Not only will rate of growth be effected, but also other internal qualities as shown by these real world examples. 4. Tell me more about your trees, what species? Hybrids? Why did you choose to grow them? are they for guitar use or other uses? Well, I’ve already covered most of this one. My property here on the Niagara Escarpment is like a who’s who list of Carolinian tree species. I was blown away the first time my wife and I looked at the property. I would not have even known this if I had not first had an interest. I’ve since added more Carolinian tree species that were not represented here, such that my place will be like a mini arboretum as these trees mature. I’ve also planted the American Chestnut, with the hope that the eventual seeds will be spread up and down the valley by squirrels. I suspect that you know the story of this tree, if you do not, I am giving you some home work. Note: the American Chestnut is not the same as a Horse Chestnut. I also have had to veto my wife from planting various things that do not belong. The risk of planting non-native plants is that any of these could become invasive, such as the Norway Maples and the Buckthorn that I am at war with. I’ve already cut down many of these. The only Hybrids that are allowed here are natural Hybrids of native species such as the Freeman Maple – there is still a debate regarding if this is an actual separate Maple species or a natural hybrid of the Silver and Red Maples. At any rate, I’ve planted two. 5. Once cut, how is the lumber dried/cared for before it is made into a guitar? This is another very long field of study for people in the wood industry. Ultimately it gets down to kiln drying or air drying. Either way, the wood needs to be stickered properly with weights on top of the stack so the wood can’t bend, warp, or cup. It also needs to be sealed on the end grain to prevent checking. There are moisture meters to check how dry the wood is measuring moisture both within the cells and between the cells. Kiln dried wood is usually less deformed (warps, etc) but the high temp within the kiln can make the fluids in the wood move blurring the color. While air dyed wood may have more bends, cups etc, but the texture and color is usually much nicer. Since guitar builders want only quartered lumber, and since quartered lumber is more stable in all directions, the risk in air drying is minimized. For people with out the measuring equipment, the rule of thumb is “one year of aging for each inch of thickness”, but this varies on the density and pour structure of the lumber. Once thick boards are “sort-of” dry, then ripping them to quarter inch thickness and stickering for further drying will allow usable back and side sets in just a few months – how ever I will still hold these for a few years before using them. 6. I have read that the soundboard is the most important piece of wood on a guitar for sound production, would you agree? why? What wood do you perceive to be the best for the soundboard? why? Already talked about this one. Spruce followed closely by Cedar. 7. Would you say a high-quality guitar is based more on the materials or the luthier? Why? A great luthier would be able to bring out the very best in any wood, making a wonderful guitar, even if not from the best wood, while a bad luthier could mess up master grade materials. Since the labor is the majority of the cost, and a three or four thousand dollar guitar could be made from as little as $150 of wood, the question is why would a hand builder not spend a little more for better materials? I would think one would want to make the best guitar they could and the material costs are just a small faction of the process. 8. Have you or would you ever consider using man-made materials for guitar construction? Why or why not? I do not use plastic in my guitars except for the pick guard. Using plastic would actually make a few things a lot easier. Making wooden binding is actually very hard, can go ary, making the guitar look less perfect, making the luthier look less skilled, and yet does not effect the sound, so it does not actually mean anything. Sometimes I feel like I am bashing my head against the wall with this but it is also a point of pride when it all goes right. The no plastic thing is like a point of stubbornness on my part. However, various types of plastic and composites have been used by various manufactures over the years. Ovation guitars is a case in point with their plastic rounded backs. Most plastic guitars have be failures, both in tone and in longevity, since plastic degrades over time and these guitars have mechanically failed. The problem with wood is that it is effected by atmospheric changes, such that a too high or too low humidity will expand or contract to fibers of wood, with the result being that the guitar can crack or expand changing the playability. A studio or home environment for a guitar can be controlled, but a touring musician can be in a constant fight to maintain their guitars playability though the use of guitar case humidifiers. A too high temperature can actually lead to glue and or finish failure. Carbon fiber is the one man-made material that looks like it could remedy this problem, while also providing a guitar that sounds like a guitar. The carbon fiber effectively replaces the wood fiber with similar densities, while the resins mimic the lignums. By tailoring the laminates thickness and direction, carbon fiber guitar builders are able to mimic the tone of wooden guitars, while also building an instrument that will not be effected by the environment. The state of the technology currently, is that people are still feeling it out to find combinations of structure that sound most pleasing. The good point is that all the guitars of any one model of a carbon fiber guitar brand will sound the same, yet this is also the bad point. The good point of wooden guitars is they all sound different, but this can also be the bad point. I have thought about building with carbon fiber, since I have actually worked with this stuff doing repairs on my windsurfing gear, but I love my woods. I'm the Tree-hugger after all. Plus it would take a complete re-tooling of my shop area. 9. Have you tried any methods to reduce material costs ie. use a less expensive species, glued smaller pieces together etc? what was the outcome? The cost of the wood is not a major consideration for me until I get into back and side sets that cost upwards of $250. I will reserve those sets for guitars that get all the bells and whistles (the fancy guitars will lots of shell inlays and other features). I have resawn White Ash and Black Locust with the result that my material costs where lest than $10 for a back and side set (this is before my labor cost on top). The average African Mahogany set cost about $45. The average Hard Maple or Indian Rosewood will cost about $150. I have Macassar Ebony at $250. I have two extremely rare Osage Orange sets at $250. Koa at $400. African Blackwood at $800. Brazilian Rosewood at $1500. All these costs are only the back and side sets for acoustic guitars. People will consider these woods for both tone and looks. Brazilian Rosewood is considered the holly grail of tone woods for acoustic guitars, but because of over harvesting, this wood is no longer available with the exception of pre existing stock and reclaimed lumber from old barns and railway tracks. These exotic woods are actually part of the selling point such that some collectors insist on them. A point I have learned and something most guitar builders have missed is that Rosewood is a legume (a member of the Fabaceae, these are all pea plants). So is Koa, so is Paduck, so is Canary wood, so is Monkeypod (thus the pods), so is Bubinga (like my Gibson CL-35 guitar), and so are many other hardwoods that the guitar world is now tuning to as traditional tone woods are becoming harder to get. It turns out “Peas make great guitars”! Since these species are all members of the same family up the tree of life, they all have very similar qualities, such as steam bending rates, density, oiliness, grain structure, etc. There is however a wide range of color. In Canada, we have three native tree sized Pea plants, the Black Locust, the Honey Locust, and the Kentucky Coffee Tree. I am about to finish my first Black Locust instrument – a small body soprano guitar the size of a ukulele – and can hardly wait to string it up. I have a full size Black Locust and a full size Honey Locust pair of guitars not far behind. The verdict is still out until I actually play these for the first time, but so far their tap tone is every bit as good as any rosewood guitar I’ve seen. If the Black Locust is as good as I think it will be, then that means I could turn to a great native Canadian wood as a replacement for exotic lumbers, thus curtailing to some degree, the destruction in the rain forests of the world, and the exploitation of native peoples. 10. Is there a relationship between the colour of the wood and its characteristics? Yes. Spalt will be evident by color. Wood with a lot of grain, or ring porous woods will have an overall color difference as compared to the same species less porous (faster growning). Runout can be seen by the way wood reflects light, thus changing color as you spin the wood under a constant light source. And cutting flat sawn, rift sawn or quarter sawn also changes how the grain is exposed thus changing overall color. Any figure such as Flame or Birdseye will change color around those features. So yes, color along with other elements tell a lot. 11. What qualities do you look for in wood used for the sides? ie, density How do you bend the wood? Well, I’ve already covered a lot. The sides will be the same species as the back, preferably from the same board as the back so it has all the same physical features, although I could allow for some runout on a back while a side should have as little as possible. The stress of steam bending (which I do on an electric steam bending iron) will separate the grain in any area with too much runout. If the grain starts to lift, it can lead to a split destroying the wood for use as a side. 12. How do hard woods differ in sound than soft woods? why? Here is fun one. When you say “hard wood” do you mean a wood that is hard, or do you mean a wood that comes from the Hardwoods (Angiosperms)? When you say Soft woods, do you mean a wood that is soft, or do you mean a wood that comes from the Softwoods (Conifer)? English really breaks down here and does not convey what people are asking. Balsa wood, is a very soft soft wood but is a hardwood (tree with leaves / Angiosperms). Fir Tree lumber is very hard but the tree is a Softwood (tree with needles, a conifer)! Your question picks at a huge pile of mythology within the guitar world. For every rule of thumb, you can find an instrument that contradicts that rule. I’ve already talked about the sound propagation rate in Spruce, and that is about the last point on which the guitar world will agree. Every combination and even the way things are glued up makes a difference to tone. Yet it is hard to generalize. Take density for example. Maple, Ebony, and Rosewood are all hard dense woods, yet Rosewood acoustic guitars will generally be warm sounding, while Maple (that is very slightly lighter than Rosewood) will be bright, and Ebony (that is slightly heavier that Rosewood) will also be bright. ??? The top wood of an acoustic guitar must be lightweight while being strong enough to not collapse under the strain of the strings. Spruce is one of the few woods that can do this. The strings of the guitar do not have much mass, or energy, but that vibration energy has to efficiently be transferred to the top wood of the guitar, in turn setting the entire top into vibration. Then a feed back lope starts where the energy of the top sustains the strings. A top that is too stiff will not vibrate with enough energy, and one that is to heavy will also not respond. A top that is too thin thus not strong enough will eventually fail. So the wood has to have that perfect blend of strength and lightness. Then the grain structure and oils or other substances can dampen sound waves within the wood. Finish will also have a big effect here. That is one of the reasons cheap guitar (with thick plastic finishes) sound cheap, even if made of better woods. The thing about all these woods is you have to play them. It is all subjective. One person could love what another hates, and a different sound can lead you toward going to a new musical place. That is one of the reasons I don’t hesitate to try non standard woods. 13. How do inlays of different woods affect sound? Are they added strictly for aesthetics or do they have other significance? Inlays are generally put in places that do not effect the sound to any normal persons ability to hear. Every change of mass will effect sound waves as they travel though the guitar. If an inlay is placed in an acoustic guitars top (don’t do this, except in the rossette), it not only effects mass, but also disrupts the grain structure, thus having a negative effect. If inlayed into a fretboard or the headstock, you could consider that it has no sonic effect. So, you can keep adding inlays until you are aesthetically pleased. However, one area where inlays do have a significance is the fretboard – but not for sound. The fretboard has Position Markers (inlays that serve as reference markers) to help in the identification of the players hand position up and down fretboard. And further decorative inlays added to the fretboard must be done in such a way as to not confuse these reference marks. 14. What makes a wood ‘high quality’? It depends on what you are doing with it. An ordinarily low quality knotted twisted bit of wood can make great inlay material or non structural parts like a head-cap or end-graft. We have already covered this in other answers. 15. What wood would you say is the most popular in the industry? Acoustic guitar tops: Spruce and Cedar as already noted in previous answers. Acoustic guitar backs and sides: Rosewood, Mahogany, Maple, and more recently Walnut, Koa. But now others are finally being thought about. This gets to a whole conversation about the stuffy guitar world and it’s Eurocentric attitudes. The guitar was mainly developed in Europe, Europe has very little bio diversity in tree species when compared to other parts of the world. They had a few species of trees to chose from, and very quickly standardized as to which woods to use for which role. Once they had their standard, that quickly became the “Right way” to build a guitar. The use of Rosewood was an accident of history, with Rosewood being the best ballast for empty sailing ships returning from the Americas. It was heavy and yet had some value as wood for furniture building when it was off loaded. Some luthiers tried this stuff, found it bent well, sounded good, and looked good. It also became a standard. There is a very similar story for Honduran Mahogany, but with the main part of the story being that it was very inexpensive right up until the last decade (now it is depleted). Maple from Europe and North America, Rosewood, and Mahogany became the standard woods, people became used to how these sounded, thus becoming the way a guitar “should” sound (but there is no “should” in music), and thus the guitar world did not look left and did not look right. We now know, that we do not know how many different species of trees there are in the world. We estimate that it’s well over a hundred thousand. Contrast that fact with the arrogant viewpoint of the guitar world that only the three (maple, rosewood, and mahogany) can be used to make a guitar. Rather, each branch up the tree of life has something to offer, and if writing music is about exploring, what better way to get started than with the various different woods of the world. Necks: The standard is Mahogany and Maple, - here you need a wood that is very stable in all directions, and strong. With those considerations, I’ve already used American Sycamore, Black Walnut, Butternut, Cherry, in addition to Maple and both African Mahogany and Honduran Mahogany. Fretboards: The guitar world expects dark colored woods for this, so Ebony and Rosewood are the standard, with the exception of Maple for some electric guitar fretboards were the Fender Telecaster is the prime example of this. The fretboard must be made of a wood that can hold the frets over the long term and also resist wear caused by strings and fingernails contacting the surface. Many woods meet these requirements, and if not holding to the color discrimination, even more would be able to be used. I have already make fretboards out of additional species such as Bloodwood, Ziricote, Bocote wood, and Wenge. Electric guitar bodies: Swamp Ash (what ever species that is), Mahogany, Alder, Basswood, Poplar, and for tops of electric guitar bodies – Flame Maple. But just like the arguments for the other parts of guitars, many other woods work for this. Factory guitar designs imply a number of cascading decisions. First they must consider a sustainable supply of any species they set up their tooling around, and swapping in some other wood most often in turn requires a change in tooling due to different densities, and tool wear characteristics. Different species of wood, may need different amounts of grain filling, and differing layers of paint, or may not even take a color the same way. This list could go on and on. In the case of a hand builders doing one off projects, there is no standard factory set up, so that the builder is adapting to each new wood as it presents it’s self. Each wood can be applied in numerous and interesting ways and is part of the appeal of a hand built instrument. The woods used in hand built electric guitar bodies thus can read like a smorgasbord menu. 16. Do you use different varnish/sealant for different woods? Why? aesthetically or functionality? For my Acoustic guitars: I only do a traditional French Polish, which is a very labor intensive way of hand applying shellac over many many hours. The shellac is both the sealant, filler, and final finish all in one. It gives the most sonically clear finish available, but is delicate and costly. However, it can be renewed at any time, even two hundred years from now (how many new fangled plastic finishes could you say that about?). When talking about the use of sealants, you have to talk about “open cell” or “closed cell” woods. An open cell will absorb liquids while a closed cell will not. Mahogany is a very open cell wood, while Maple is very closed cell. When applying a finish on Mahogany, it will keep drinking up the finish for a long time and will need a lot of sanding to level the finish, while Maple will look like it has a finish after just sanding with a fine paper. The finish will go on very thin and look great after just a light sanding. 17. Would building a guitar entirely out of one kind of wood be wise? why or why not? I have essentially already done that, with the exception of the fretboard (an all Cherry Tele, electric guitar, with an Indian Rosewood fretboard). The fretboard must be made of a wood that will hold the frets firmly and also that will not get worn out by the players fingers and fingers nails as they make contact with the wood. That is why very hard dense woods are use for the fretboard. People are fixated on Ebony and Rosewood because of tradition, with the only real exception being the maple fretboards on some Fender style electric guitars. I use those all the time but I’ve also made great fretboards out of Ziricote, and have current projects with Bocote, Bloodwood, and Wenge fretboards. So the concept of making the guitar out of just one type of wood could go two different ways but has disadvantages in either case. A guitar made out of softer lighter woods would be nice and light, but it's fret board would not hold the frets very well, and show a lot of wear. A guitar made out of a hard heavy wood would hold the frets well, show minimal wear over time, but be so heavy it would be tiring to play for any longer duration. This is all before considering tone. The optimum way to build is in fact the way it is done all the time, using different woods for different jobs. 18. Have you worked with any unique woods in the past? What was the outcome? YES, YES and YES! I've already talked about this through out this document. One of my best sounding acoustic guitars has Paduck back and sides. I made a great sounding electric with a Butternut body. My Sycamore acoustic sounds much like a Mahogany guitar but fuller. So far, it’s all good. 19. What would your ideal guitar be made of? Why? That’s like asking would your ideal partner be a blond, brunette or redhead??? They are all different but all are wonderful. 20. How long have you been making guitars? Eleven years now, working part time, between my Airline Pilot full time job. "Flying supports my guitar habit." 21. How does your work reflect your personality/what makes your guitars unique? I use a lot more types of wood than most builders, however the main thing that makes my acoustic guitars relatively unique is the finish. In reflecting my personality, you could say “adventuresome” in regards to my willingness to use all these different types of woods. But I also consider “Fake” to be a four-letter word. Therefore, I don’t paint or stain my guitars, don’t use plastic, and just stick to natural materials. One of the points about using all these various woods is that they also have some wild colors that most people have never seen in wood. They are surprised to learn that these colors are natural. If any part of the guitar where then stained, it would confuse the impact by blurring what is natural and fake, like mixing apples and oranges. So I like to keep that part of it straight forward. 22. What is your favourite part of the job? Putting the strings on a newborn guitar for the very first time, bringing it up to pitch, and giving it a strum. But I can’t just stop there, I usually play it for a few hours when I get to that point. 23. Who did you learn the craft from? Is there one significant thing you learned from them? Books and videos! "If you can read, you can do anything." Actually, just as a person who is good at one sport, is usually good at many sports. Or a person who already knows a number of languages, can then more easily learn another. I've always been building stuff. I've been doing the setup on my guitars since I was a teenager, modified one of my electrics just after high school cutting out wood to install humbuckers and new switches, and 20 some odd years later did a fret job on that same guitar (after reading a book on how to do it and buying the right tools). When I finally decided to actually build a guitar, and after seeing the investment in tools and jigs required, building just one didn't make sense. "Could I see myself building more? ", was a question that rolled around in my head for a few years, and when I said "Yes", I actually purchased 2 acoustic guitar kits to start with. In fact, a guitar kit where some of the hard jobs are pre-done is a good way to learn to build. As it turned out, that second guitar already saw a lot of modifications reflecting what I want to see in a guitar. Unlike the protective and secretive old world of trade guilds, we now can benefit from a electronic culture of inclusion and sharing, where a question can be posted to an internet news group or forum, and many people from all over the world will answer a question, even giving many approaches and options. The are many books, videos and even Youtube available. Even tool or materials suppliers give out "fact sheets" with techniques for how to work with what they supply. There are local meeting of like minded individuals (guitar builders club meetings) where we "show and tell" and "Brag" about how or what we've done. All these are learning opportunities. I learn something on each new guitar, and since there are sharp tools involved, there have been a few time when the learning was the hard way. 24. How long does it take to make a guitar from start to finish? Fulltime builders can do an acoustic in about 4 months. I take a lot longer since my Pilot job cuts into my guitar building. I also have a disability that effect how much flying I can do, and often leave me too drained to then turn to my guitar projects and keep working. When I am feeling better, I then go into the shop and move the various projects forward. But I seem to be easily sidetracked by the latest coolest new wood I just got, so I have to dig into it, bending sides, or happily cuting out an electric guitar body, with the result that I have way too many guitars on the go. My guitar shop looks like a candy store of guitars with all these different combinations of materials. As I receive orders, those designated guitars then move ahead of the other guitars started on spec, such that guitars finished are not in the same number order as guitars started. The fastest I completed a single guitar is a half a year (but that was when I was off on medical leave), while there are stragler instruments still not complete that were started half a decade ago. 25. 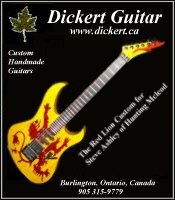 Where can your guitars be purchased? By appointment for now. 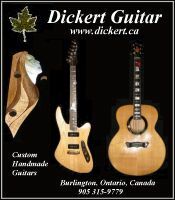 My website www.dickert.ca has all the contact info there. In fact it may be a bit early for me to say that Black Locust IS the golden tonewood, since I have so far only completed one soprano guitar from this wood, and my first full size guitar made of Black Locust wood is not yet complete. The other reason for the statement being early, is that no one else is using this wood - yet. However, it's color is actually Golden, and the medullary rays in the wood make it sparkle. Brazilian Rosewood is currently considered the "Holy grail of guitar tonewoods". Brazilian Rosewood gives a great tone and response, plus has a great look. It's use in the guitar world quickly became a standard, and that standard created an expectation of "how a guitar should sound". But that "Should" is also objective. The tree is now endangered with trade embargoes on the lumber. The guitar world has slowly been forced to look around for other woods. Considering that the modern science community estimates that there are over 90,000 different species of trees in the world (no one actually knows the number), finding an alternative should not be that hard. But the guitar world is also conservative, turning to the more similar species - Indian Rosewood -first. Unfortunately, the Indian government has made acquiring that lumber more difficult as well, thus other woods are now being looked at. It makes sense that other woods from the same family of plants as the true rosewoods - the family Fabaceae (or Leguminosae) - having similar properties, would also make wonderful guitars, and that is in fact what has been found. Thus we now find a disproportionate number of the alternate successfully implemented woods turning out to be from the family Fabaceae. Thus "Peas make great guitars"! As the guitar world has tuned to these alternates, so have other wood consuming industries, with the result that many legume species of trees are now on threatened or endangered species lists, forests and forest habitat have become degraded partly due to their harvest, and native peoples have been exploited. As it turns out, North America also has trees in the family Fabaceae (leguminosea - tree size pea plants). Here in Canada we have Black Locust, which is native to North America but not to Canada. It was planted in Southern Ontario during the 30's dust bowl years because it helped stop erosion due to it's ability to spread with root runners, and since being a pea, it actually makes topsoil. This tree has since naturalized and become an invasive species, thus cutting it down is desirable, in contrast to so many other legumes. Within the legume branch of the tree of life, most species have very similar qualities, yet the range of these similar qualities is still wide enough to make quite different sounding guitars. An example of more familiar Fabaceae (leguminosae - legume - peas) are not only the rosewoods, but also Koa (endemic to hawaii). It turns out that Black Locust's tap tone is actually more similar to Brazilian Rosewood when measured on this scale. My currently unfinished Black Locust guitar already has an amazing tap tone, long sustain, and great power. The verdict will still be out until the strings are finally strung up on this guitar, but I am sure it make an amazing instrument. Honey Locust, Kentucky Coffee tree, Kentucky Yellow Wood, Mesquite. If you know of any others, please tell me about them. I am looking for large diameter logs at least 20” (excluding the bark) by at least 3 feet long. Also large quarter sawn boards 9 inches wide. Hardwood trees such as Black Locust, Honey Locust, Osage Orange, Black Cherry, Ash, Maple, Sycamore, Mulberry, Tulip Tree, Elm, Hackberry, Walnut, Butternut, Birch, Basswood, Beech Tree, Horse Chestnut, Catalpa, and Ironwood (for necks therefore may be smaller), or any other interesting trees you may come across. Softwood trees such as Spruce, Fir, Tamarack, Redwood, may be of interest. Also if you have exotic lumber (quartered only) or logs, call me. Useable logs should be straight with few if any knots. I am also interested in logs with spalting, but the wood must be solid. "It is agreed by most makers of handmade instruments, that the acoustic properties of French polish are far superior to that of any other finish. With a French-polished finish of shellac, the finish is only a few thousandths of an inch thick. The dampening properties of this finish are less than tougher synthetic finishes." This article is re-printed from the Guitar Salon International Web site. Thank you GSI for this excellent article. Some classical and flamenco guitars are finished by French Polish method using some combination of shellac, gum resins, varnish, etc. These finishes are very lovely and refined, but they are extremely delicate as well. Many guitars over $3,000 sold by Guitar Salon International utilize this type of finish. It is generally considered the most desirable finish, except by some concert artists whose guitars experience a lot of wear and tear. It is far more expensive and difficult to apply requiring hundreds of very thin coats applied with an alcohol-damp rag dipped in the finish solution. In the original method, pumice is used to fill the pores, although in the U.S., many builders use an alternative method by spraying or brushing on some kind of filler, which they sand, then apply the shellac by French Polish method. This saves time and works very well. Regardless of how it is initially applied, this finish needs to be treated with great care to preserve your fine guitar. It should not be cleaned with any cleansers, rubbing compounds or other agents unless made for use with French Polish finishes. I have seen a couple of fine guitars ruined by scrupulous owners who "polished" their vintage guitars with Lemon Oil or Pledge. These finishes, particularly when old, are very thin and porous. They protect the wood from general handling, but not from direct exposure to such agents. Any polish should be applied to the rag first, then to the guitar. Nothing should be sprayed directly onto your instrument. Moreover, this type of finish is susceptible to fingernail scratches and direct hits especially to the soundboard. When tying the strings behind the tie-block on the bridge, you should use caution not to damage the finish with your fingernails. One way to protect the finish from this kind of damage is to place a piece of cardboard behind the bridge before beginning to tie the strings. Light masking tape can be used to keep it in place, but is not necessary. In fact, just being aware of the problem normally is adequate to prevent damage behind the bridge,even with very delicate French Polish finishes. Buttons and buckles will similarly damage the finish of French Polished guitars and need to be avoided. General caution when playing your instrument is recommended. If your finish becomes dull at or near the point of contact with your body, this is normal. We advise people not to expose their bare skin to a French Polish finish because it dulls over time. If you are wearing a short sleeve shirt, wear a sock over the portion of your right arm that makes contact with the guitar. When wearing short pants, use a soft cloth on your left thigh. French Polish can be restored to its original luster by an expert repairman with very little difficulty and expense (if he is familiar with the method of finishing). New finish is normally applied to the old without removing it. This is one of the great advantages of French Polish over more common lacquer or catalyzed finishes. Normally these need to be removed completely before refinishing. In summary, it is possible to restore the finish of a vintage classical or flamenco guitar without complete refinishing. Hamilton Guitar Association Hamilton Guitar Association is an organization of musicians dedicated to the promotion of fingerstyle guitar in the Southern Ontario area. Guitarists from all musical styles and backgrounds come together to perform, discuss and share their music in a non-competitive and encouraging environment. It is a wonderful opportunity to interact with like-minded musicians, as there is always something new to learn from each other. Suppliers of guitar woods and components. Burlington Exotic Woods Inc. Fine Quality Lumber, Veneers,& Supplies - Since 1978. Come to Exotic Woods for knowledgeable and friendly service. Alaska Specialty Woods "Highest quality Sitka Spruce in the world as well as excellent quality Alaska Yellow Cedar and Western Red Cedar." If you consider the term “Soft Rock” an oxymoron, “Smooth Jazz” and elevators synonymous, and you're just plain sick of the pabulum the local radio stations are feeding you, then WEER-Music is the link you need to check out. This site showcases the greats of both Jazz-Fusion and Progressive Rock. The real stuff... and yes... I know this is a lot harder than the music I have recorded here on my web site. That's because to put it bluntly, I'm nowhere as good as the musicians and bands presented on the WEER-music show (ok, I'm barely in the same universe). If I were able to lay it down, I would. 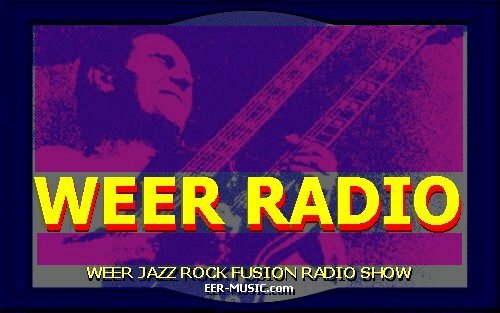 What these guys at WEER do is put together a two to four hour streaming audio show each month along with a play list and links to the artists web sites or a site where you could purchase their CD's. Be forewarned, the site is a mess, with a ton of photos, pictures of album covers, music ads, and other related links. Enough to keep you busy reading for a week. So click on the link if you're actually into listening to music. This stuff demands attention so turn the volume UP and enjoy!